This property offers unobstructed views of the Vancouver harbour and is within walking distance of business and tourist destinations. 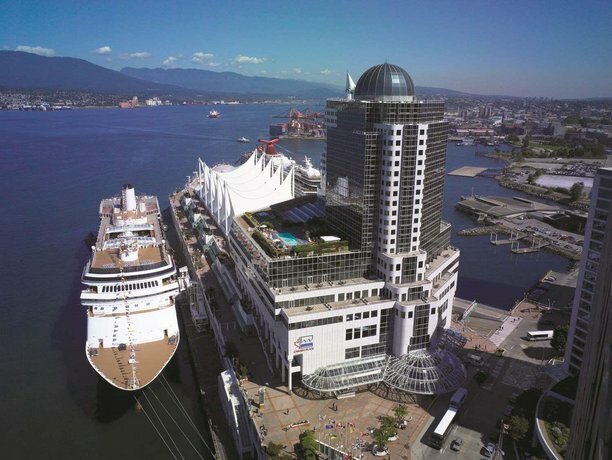 This hotel is located on the Vancouver harbourfront next to the cruise ship terminal and a 2 minute walk from the Vancouver Convention Centre. All 500 rooms and suites at this property include a flat-screen TV with pay-per-view movies, an iHome docking station, a coffeemaker, a safe, individual climate control, and bathrobes. Units are also equipped with a mini-bar and refreshment centre (extra fees apply) and in-room Wi-Fi for an additional fee of $4.95 per 24 hours or $14.95 for enhanced Wi-Fi. Guests staying on the Pacific Club floor have exclusive access to the Club Lounge which provides a free breakfast, free evening hors d'oeuvres, free Wi-Fi, and free coffee and tea. Self-parking is available for an additional fee of $39 per night and valet parking is $43 per night. Pets are permitted for an additional fee of $30 per stay. There are four on-site restaurants at this hotel, including Cafe Pacifica which serves breakfast, lunch, and dinner. Other on-site amenities include a rooftop heated saltwater pool and hot tub, fitness centre, on-site salon and spa, dry cleaning service (extra fees apply), an ATM, and gift shops. Access to the Seawall trail system is a 2-minute walk from this property. Stanley Park (1,000-acre park with hiking and biking trails) may be reached via the Seawall (25-minute walk or 10 minutes by bike). Driving to Stanley Park will take roughly 5 minutes. Downtown attractions within a 10-minute walk of this hotel include the Vancouver Art Gallery (featuring the artwork of Emily Carr), Pacific Centre Mall, Vancouver Lookout (observation tower with a viewing deck 550 feet above ground), and Gastown (an area known for its dining and nightlife). Many guests were very pleased with their stays at this hotel and gave excellent ratings in the reviews read for this editorial. Compliments touched on the hotel's location, rooms, staff and dining, as well as their leisure amenities. Many guests found the location convenient for accessing downtown attractions, the Vancouver Convention Centre, shopping, and restaurants. Several reviewers also noted that this hotel provided convenient access to the cruise ship terminal and these guests also mentioned that the hotel bell staff delivered luggage to the cruise ships. One guest said that the hotel "could not be more convenient for cruise passengers". The guest rooms were frequently described as clean, well-appointed, and spacious. Many reviewers also described pleasant views of the harbour from their rooms and one guest described the view as "stunning". Many reviewers described the staff throughout the hotel as friendly and attentive, with one guest summing it up with saying that the staff go the extra mile for guests. Many guests praised the food at the on-site restaurants and from room service. The rooftop pool, well-equipped fitness centre and club floor amenities were all mentioned as value-added features. As mentioned above, most guests described positive experiences at this hotel, among the reviews used for this analysis. However, there were a couple of common concerns. Although many guests praised the food at this hotel (as mentioned above), several reviewers thought that the on-site restaurants were expensive. A couple of guests were disturbed in their rooms by noise from sea planes that were landing and taking-off at the nearby harbour airport. A couple of guests, who did not stay on the Club floor, complained about the additional fees for Wi-Fi ($4.95 per 24 hours). One reviewer thought that the parking fees ($35 per night) were expensive. Expedia.ca gave this hotel an average score of 4.5 out of 5.0, with 93% of 420 guests recommending the property. 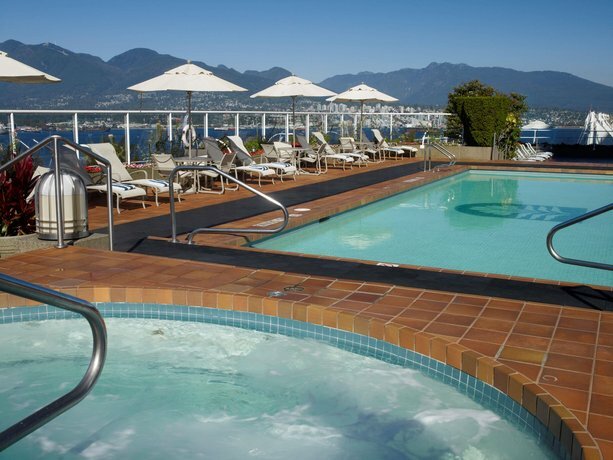 TripAdvisor.ca ranked this property #19 out of 101 hotels in Vancouver, from 819 guest reviews. Hotels.com gave this hotel an average score of 4.6 out of 5.0, based on 171 reviews. The average guest rating for Pan Pacific Vancouver is 9.2 out of 10 based on 3958 reviews from past guests. This average guest rating ranks Pan Pacific Vancouver at #6 out of 91 hotels in Vancouver.